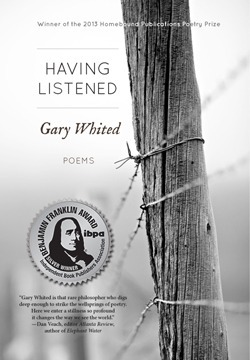 “A gentle deferral lies at the center of Gary Whited’s Having Listened. It’s not about what he thinks or declares, but about the fruits of patient listening. Fathers and fence posts, horses, prairie and creek beds, speak in subtle flow, silence, poise or uneasiness. Deference to the sharp or subtle splendor of the place frame the poems collected here—verse occasionally broken by a wise remark from Parmenides or an occasional prose reverie. The surprise and afterglow is memorable. I’ve returned often to the tunings offered here: astonishing, wonderful, drifting by like prairie wind. Gary Whited grew up on a ranch in eastern Montana, where his maternal and paternal grandparents had homesteaded in the early 1900’s. Leaving the ranch to go to college, Gary eventually found his way into the study of philosophy with a special interest in the ancient Greek thinkers. He was intrigued by a kinship between the ancient ways and the life he’d known on the prairie. He studied classical Greek and eventually translated fragments of the Pre-Socratic thinkers, including the poem of Parmenides. 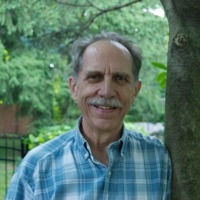 He received his Ph.D. in philosophy from Penn State University in 1973. For several years Gary taught philosophy at various universities, including University of Montana, University of Texas and eventually at Emerson College in Boston. While teaching philosophy, Gary became interested in the practice of psychotherapy with its keen attention given to the art of listening. He realized that the activity of listening was a thread that ran through his entire life, starting with listening to the subtleties of the prairie landscape and to its people, to the ancient Greek classical voices, to his philosophy students and eventually to clients in his private practice as a psychotherapist. All along the way he wrote poems, trying to capture the many voices of the prairie, which is how his book Having Listened came into being. A strong sense of place pervades his poems, whether that place is the prairie, the city or the inner spaces we inhabit. His poems have appeared in several journals, including Salamander, Plainsongs, The Aurorean, Atlanta Review, and Comstock Review. He is currently working on a new translation of the complete fragments of Parmenides. He lives in Boston with his wife, Elizabeth, a painter. Together they have two grown children, two grand children and another coming.